New Ferrari in the works? A new Ferrari supercar has been spotted outside the carmaker’s factory in Maranello, leading to speculation that a new model could be in the works. The car’s mid-engine layout and similar proportions to the F430 could mean this is a test mule for the successor of the current supercar. However, the completed look of the new model suggests that it could be a new concept car or oven a custom coachbuilt model based on the F430. Ferrari has confirmed that it plans a return to its coachbuilding heritage this year, and is already working closely with Italian design houses Fioravanti, Pininfarina and Zagato. Other reports suggest the car is the new Ferrari F500, a 5.0L successor to the F430 that could appear as early as next year. According to AutoBild, Ferrari is planning to increase output to around 500hp to remain competitive with cars like the Porsche GT2 and even Nissan’s GT-R, which are beginning to encroach into exotic car territory with their performance levels. I'm really not getting Ferrari's new designs (well just the California). But as long as they're fast, powerful and great to drive, then why not. Jeez. Did Autobild accidentally mix their photos from 1985? Whatever it is. I hate it already. Maybe it's a one off special? *It seems to be missing the sills and the rear bumper. From what I heard from autoblog, that is a pinnaferina one off based on the F430 for some customer and not a production prototype. A bespoke 430 seems a little bit of an extravegant waste though. 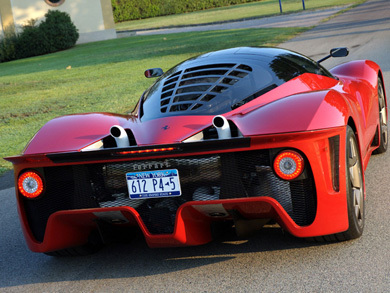 The bespoke Enzo made more sense. ^Yup. They tend to be spectacular. It's a Fioravanti one off as I expected. The design seemed reminiscent of the F100 concept. Now we have confirmation. And the black parts are bare carbon fiber, apparently. ^It's just a reskinned F430.